Human newborns are uniquely helpless after birth, compared to other primates. They are entirely dependent on caregivers and require an inordinate amount of attention. The human neonate has been described as “costly and cute” (Trevathen and Rosenberg 2016); the costs refer to the dedicated labor and financial burden involved in raising a child. Fortunately costs are balanced by the attractiveness of the newborn and their capacity to captivate the attention of carers. The early dependency of babies favors processes of learning and socialization and reinforces the central importance of parenting in supporting healthy development. The newborn is proficient at signalling hunger to their mothers via the hunger cry (Gilbert and Robb 1996; Zeskind et al. 1985). The hunger cry is the culmination of a series of behaviors from agitation, mouthing, and discomfort to a distress call. Research on infant cries indicates that adults listening to cries are able to distinguish the hunger cry from the pain cry through perceived and physical acoustic differences (Zeskind et al. 1985). Over the first year of life, the hunger cry changes in acoustic characteristics with an increase in fundamental frequency which signals the transition from reflexive to intentional crying (Gilbert and Robb 1996). As motor skills develop, infants become more adept at communicating hunger, appetite, and satiation in diverse ways. To be effective, however, communication between the infant and the caregiver is dependent upon the sensitivity of the receiver to recognize, interpret, and respond to these signals (Hetherington 2017). The World Health Organization defines responsive parenting as “prompt, contingent and appropriate interaction with the child,” and responsiveness is associated with better health outcomes and psychosocial and cognitive development (WHO 2006). Therefore, how infants communicate their energy needs and the ways in which parents respond to them are key to healthy growth and well-being. Babies are born as “univores” securing all their nutrient and energy needs from a single source, namely, milk. At around 6 m of age, infants are introduced to solid foods as energy, and nutrient requirements can no longer be met by exclusive breastfeeding (WHO https://www.who.int/maternal_child_adolescent/documents/9241593431/en/). The solid foods “complement” nutrition and energy provided by milk, thus the term “complementary feeding” rather than weaning, since infants can be fed breast milk long after 6 m. The transition from univore to omnivore has been described as the omnivore’s dilemma (Rozin 1976). The dilemma arises from the potential hazards faced by the human infant when accepting novel foods. It is at once necessary, but potentially challenging. Given that milk is sweet to taste, it is said that infants are “hard-wired” to prefer sweet substances as an adaptive mechanism to secure a safe source of energy. To accept foods with different basic tastes, the infant must experience novel odors, tastes, and textures. This transition is enabled by both innate preferences and the capacity to learn, through mere exposure and learned safety which foods are acceptable. Interestingly, and long before this transition, babies experience flavor in utero. Studies with animal and human participants demonstrate the role of fetal learning in odor and taste preference acquisition. Fetal learning occurs when flavors derived from the maternal diet are experienced via amniotic fluid. For example, Hepper (1988) demonstrated fetal learning in an animal model by feeding pregnant rats garlic or no garlic during pregnancy and then presenting garlic or onion in petri dishes to their 12-day-old pups. As a measure of preference, the time spent by the pups over each stimulus was recorded as well as the total amount of time spent on each side of the cage containing the stimulus. Pups born to dams fed garlic preferred garlic over onion and offspring of the control group showed no preference for either stimulus. This finding was replicated in cross-fostered pups. Therefore, odor learning occurs in utero suggesting a biologically adaptive behavior which favors positive associations with components of the maternal diet, perhaps to enhance kin recognition (Hepper 1996) and possibly to guide the developing pup to a safe, familiar food source. In the human equivalent of these studies, head and mouth movements are used to indicate preference for odors in babies. For example, Soussignan et al. (1997) investigated the response of 3-day-old babies to artificial (vanillin, butyric acid, formula milks) and biological (breast milk, amniotic fluid) odors using recordings of behavioral (facial and oral movements) and autonomic (respiration, differential skin temperature) events. In these studies nose wrinkling and the “grimace” facial expression were interpreted as disgust for an aversive odor (butyric acid) relative to a positive odor (vanillin). These responses may reflect biological utility in guiding babies away from odors that may indicate that a food is rancid (butyric acid) and potentially harmful (Soussignan et al. 1997). Marlier and Schaal (2005) video-recorded babies’ responses to breast milk or formula using mouthing and head orientation in a choice paradigm. Human milk produced more frequent mouthing and greater head orientation than formula even in babies who had been formula fed. Evidently, the attractiveness of human milk containing many different aromatic compounds familiar to infants via in utero experience was preferred over formula which tends to be bland and of uniform flavor. Overall, these studies indicate that during the early postnatal period, young animals, including humans, can express preference toward familiar odors (experienced in utero). The ways in which likes and dislikes are communicated in early life are through a series of behaviors including oral activation like mouthing, orientation or place preference, and facial expressions. Facial expressions in response to different basic tastes have been well characterized in newborn babies in the elegant studies conducted by Steiner (1977). In these studies, likes and dislikes to pure tastants were recorded following delivery of the substance via pipette to newborns. The subsequent, specific facial response to water, sweet, sour, and bitter tastes were assessed to determine affective quality of the tastes. Steiner observed distinctive tongue protrusions and “smile” responses to sweet, lip pursing to sour, and the characteristic “gape” to bitter tastes. These facial responses have been observed in nonhuman primates, and a collaboration between Kent Berridge and Jacob Steiner resulted in mapping “sensory typical” and affective responses to basic tastes across different mammalian species (Steiner et al. 2001). These authors proposed that human hedonic and aversive reactions are directly related to the taste reactivity patterns of other animals. For example, in both the rat and primate, there is a shared tongue protrusion in response to sucrose in solution (representing the sweet taste) and shared “gape” in response to quinine in solution (representing the bitter taste). These responses are thought to be functional, in that the tongue protrusion extends exposure time and coverage over the tongue of the sweet solution which is liked and the gape allows ejection of the disliked, bitter-tasting fluid from the mouth. Sweetness generally signals a safe source of energy, and bitterness signals potential toxicity, and so neonatal affective responses are adaptive. In addition to facial expressions in response to foods which signal likes and dislikes, human infants also have a diverse repertoire of more obvious and overt acceptance and rejection behaviors which occur in advance of the substance being tasted. For example, an obvious set of “approach/acceptance” behaviors indicating appetite and “wanting” is the extent to which the infant gazes at the food in anticipation of eating, leans forward to accept food when offered, and then opens their mouth in readiness to eat. Then the avidity with which solids or liquids are consumed provides further evidence of appetite. Once the food has been consumed, the infant may then begin to show a slowed rate of eating and a series of overt avoidance/rejection behaviors such as looking away from the food, gazing at other objects in the environment, closing the mouth, arching the back, or turning the head away (see Hetherington et al. 2016; Nekitsing et al. 2016; McNally et al. 2019). In summary, infants signal their preference for sweetness and dislike of bitterness through facial expressions. Beyond these basic responses which appear to be hard-wired and phylogenetically old (shared with other species), human infants signal acceptance and rejection as they experience new foods during their transition from univore to omnivore, from consuming sweet-tasting milk to a broad range of complex solid foods. Infants who are exclusively breastfed have already experienced a wide variety of flavors from the maternal diet and are therefore more willing to accept novel foods such as vegetables during complementary feeding (Sullivan and Birch 1994). Breastfed babies regulate energy intake to match energy requirements, showing self-regulation. For example, in a well-controlled, prospective study of exclusively breastfed babies in a developed country, energy intakes from breast milk matched energy requirements producing normal growth trajectories (Nielsen et al. 2011). In this study, volume of milk ingested, energy intake, and milk energy content were measured using the doubly labelled water method. This technique of providing mothers with a dose of doubly labelled water then sampling urine is the gold standard method for assessing energy requirements. In this study, when infants were re-tested, between 15 weeks and 25 weeks, milk intake increased significantly and matched energy requirement to sustain normal growth. In another study where breastfed babies were randomized to complementary feeding at 4 months or exclusive breastfeeding for 6 months, the researchers found no difference in total energy intakes or body composition at 6 m (Wells et al. 2012). Here, the stable isotope method was again used to determine precisely how much energy requirement was achieved through milk, and then energy intake from solid foods was determined using weighed intakes. The infants randomly assigned to complementary foods at age 4 m consumed significantly less breast milk at age 6 m compared to the babies exclusively breastfed. Both groups showed the same rate of growth and had similar energy intakes. Therefore, these studies provide evidence of self-regulation during the first 6 m of life in breastfed babies. In formula-fed babies, the capacity to regulate energy intake has also been studied, and given that the content of formula can be manipulated, this permits investigation of self-regulation related to systematic changes in energy density and macronutrient content on total energy and nutrient intakes. Fomon and colleagues (1971) gave one group of infants a lower energy density (ED) formula (54 kcal/100 ml) or higher energy density formula (100 kcal/100 ml). The babies assigned to the lower ED version consumed significantly more formula but did not manage to match the energy intake of the higher ED formula group, so gained less weight. More recently, Timby et al. (2014) randomized infants to receive a lower protein, lower ED experimental formula (60 kcal/100 ml), or standard formula (66 kcal/100 ml). Infants receiving the experimental formula consumed a significantly greater volume to match the energy intake of the standard formula. In a study of energy compensation, Brugaillères et al. (2019) provided carrot puree with or without added oil to increase energy density of the puree to 11-month-old infants; then they repeated the study at 15 m. They found that at 11 m infants compensated at a test meal offered 25 min after the puree by 52%, but by 15 m this depreciated to −14%. These data suggest that self-regulation may decline with age and that infants need to have multiple exposures to low energy density foods with added energy in order to learn about their postingestive consequences. This study illustrates the potential role of learning in infant feeding. In summary, both breastfed and formula-fed babies show evidence of self-regulation. However, with complementary feeding and the introduction of energy dense, complex foods, infants appear to compensate for energy loads less well with maturity. Therefore, there is a significant role for learning in the early years as infants associate the sensory characteristics of different foods with their postingestive consequences. As infants move away from milk as their only source of nourishment, they are offered a range of solid foods to ensure appropriate nutrition. As mentioned, infants have a positive, unlearned acceptance of sweetness, but they have an aversive, innate rejection response to bitterness. This implies that infants must acquire a liking for bitter tastes through experience, if they are to accept bitter tastes. The role of learning, therefore, is crucial in the transition from univore to omnivore. In the classic observations made by Dr. Clara Davis in the late 1920s and 1930s, she demonstrated the capacity of infants to select a diet from an array of raw and cooked foods to sustain healthy growth (Davis 1928, 1939). The small number of infants she followed generated a huge data set as all meals were recorded for up to 6 years (Strauss 2006). The infants were given solid foods on a tray, and they could select whatever they wanted. Nurses who were present to ensure the safety of the infant were instructed not to guide the infant’s choice. Overall, the infants selected a range of around ten foods per day and achieved a balanced diet, which ensured their health and well-being. One infant reversed symptoms of early-stage vitamin D deficiency (rickets) through selection of cod liver oil. The meal patterns of these infants during complementary feeding provide evidence of “nutritional wisdom,” namely, when offered a variety of wholesome foods, infants choose well – they did not simply select their preferred sweet foods but consumed a number of foods, and in some cases the infant preferentially consumed more of the cooked version of the food compared to the uncooked (see Table 1). Although infants have an innate preference for sweet, they nonetheless acquire a liking for a variety of foods covering all the basic tastes in order to attain adequate nutrient intakes, and sufficient energy to match requirements. Of course, this “experiment” demonstrates nutritional wisdom under very constrained circumstances, and it is not clear given the modern food environment of highly palatable, energy dense, nutrient-poor foods that infants would also select as wisely. These early studies by Davis reinforce the importance of learning that the infant’s appetite is influenced by the food environment presented and that given a range of foods, infants select well and not only their most preferred item. At the time of complementary feeding, when infants make the transition from univore to omnivore, they are uniquely willing to try new flavors (Harris 2008). A number of researchers have used vegetables as a first food during complementary feeding. In part this is because intakes of vegetables tend to be below recommendations globally and establishing liking for these foods in early life may provide the foundation for preferences later on (Barends et al. 2013; Hetherington et al. 2015; Remy et al. 2013). To test whether early exposure to vegetables as a first food enhances acceptance of vegetables, infants were randomly assigned to a control group receiving no prior vegetable experience or an intervention involving a step-by-step introduction of novel vegetable purees over 24 days. In the first 12 days of complementary feeding, vegetables were added to milk and then to cereal for the next 12 days (Hetherington et al. 2015). Acceptance was measured using intake, ratings of liking by mothers and researchers, as well as filmed facial and behavioral responses to pureed vegetables offered on days 25 and 26 (carrot on d25 and green bean in d26). 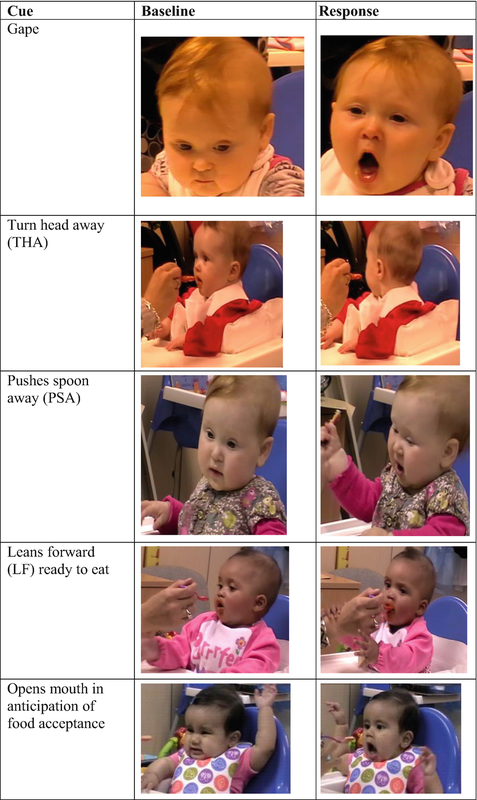 Video recordings were coded using the Feeding Infants: Behaviour and Facial Expression Coding System (FIBFECS; Hetherington et al. 2016) with six acceptance/rejection behaviors (turns head away, arches back, crying/fussing, pushes spoon away, leans forward, and rate of acceptance; see Fig. 1) and seven facial expression items (brow lowered, inner brow raised, squinting, nose wrinkling, lip corners down, upper lip raised, and gaping). Examples used in the training from the coding system are provided in Fig. 1. In this same study, infants were offered nine consecutive spoonfuls of vegetable puree, and behaviors and facial expressions were assessed per spoonful. When offered vegetable puree, the infants from the intervention group showed a greater duration, pace, and consumption of each vegetable than the infants from the control group. Investigator ratings (but not maternal ratings) of liking were sensitive to group assignment with higher ratings for vegetables in the intervention compared to the control group. Overt acceptance and rejection behaviors (reflecting wanting) differed by group assignment. Infants with prior vegetable exposure showed fewer rejection behaviors and more acceptance behaviors than those in the control group. Facial expressions related to aversion did not differ by group but did differ by vegetable. Thus, more frequent aversive facial reactions were observed in response to the green bean than to carrot. This may reflect the natural sweetness of the carrot which is accepted more easily than the green bean which is less sweet. In summary, vegetables offered as a first food tend to be well accepted, and there has been a consensus statement promoting vegetables as a food to offer during complementary feeding in order to encourage preference development for vegetables (Chambers et al. 2016). Infants exposed to vegetables at complementary feeding added to milk then to cereal show evidence of liking and wanting for these foods as a function of learning. Mothers may misattribute facial expressions as disgust or dislike, but these may simply be surprise, and it may take many exposures (between five and ten) before children accept bitter-tasting, green vegetables. So far, we know that infants are capable of signalling appetite, that they acquire liking for foods through experience, and that they are capable of self-regulation to meet energy needs. How then do infants signal interest in food, readiness to progress to solid foods, and sensations of hunger, appetite, and satiety? The types of cues which infants use at various stages of development are summarized in Table 2 (adapted from Pérez-Escamilla et al. 2017). Mothers have been interviewed to investigate how they know when to introduce solid foods (e.g., Anderson et al. 2001). In this study, readiness was signalled in terms of visual interest in foods eaten by family members. Hunger cues were described in relation to babies’ characteristics (e.g., age, weight), their overt behavior (e.g., rapid rate of milk consumption, agitation, “chewing” their hands), and external factors such as time of day and time since last feed. Mothers reported being able to identify a “hungry cry,” and they reported satiation cues in terms of expressions of contentment, especially infants appearing more settled after a feed. Hodges et al. (2008) investigated cues which prompted mothers to initiate and end feeding. Like Anderson et al. (2001), the authors found mothers used both infant behaviors and external cues (e.g., time) to identify hunger. Typical hunger cues in this study were crying, fussing, and licking the lips, and these were reported across several age groups (3, 6, and 12 months). Common satiation cues included pulling away, spitting food out, and refusing food. The prominence, intensity, and specificity of infant cues guided decisions about initiating and ending feeds, and mothers found cues easier to interpret with increasing infant age. Hodges et al. (2013) went on to develop a tool to characterize and code responsive feeding called The Responsiveness to Child Feeding Cues Scale (RCFCS). This tool has 20 types of hunger cue and 28 types of satiation cue which can be recorded during meals. Hunger and satiation cues are further categorized as “early” (e.g., increased alertness), “active” (e.g., excitatory movements), and “late” (e.g., fussing and crying) in order to reflect changes in cue intensity. The authors found that mothers were typically more responsive to hunger than satiation cues. However, better responsiveness to satiation was predicted by maternal characteristics such as healthy BMI, longer breastfeeding duration, and higher educational level. In their study of the changes in feeding cues expressed over time, Hodges et al. (2016) observed mother-infant pairs during mealtimes at infant ages 3, 6, 9, 12, and 18 months in the home. They used RCFCS at each time point and noticed that fullness cues became more diverse and less subtle over time. For instance, in the first two observations (3 m and 6 m), disinterest, falling asleep, and decreased muscle tone and activity signalled fullness, but during the later observations, pushing or pulling away and communicating “no” verbally became more apparent. In relation to appetite, postural attention and reaching for food increased after 6 months. As the infant develops, their motor and language skills enable them to assert interest or disinterest in eating. Similarly, a study by Skinner et al. (1998) used pictures of hunger cues, and mothers were asked at what age these were displayed by their baby. The authors reported that cues of readiness to eat (e.g., opening the mouth as the spoon approached) appeared at a younger age than satiation behaviors (e.g., closing the mouth to reject food) (4.4–5.7 months vs. 5.8–7.5, respectively). Food dislikes were communicated via facial expressions and by body movements, such as turning the head or the body away from food or throwing food away. These signals of food dislike appeared by 8 m of age, and strong indications of food likes and dislikes increased in frequency with age. Overall, mothers reported that their infant’s ability to communicate improved in scale and scope over time in tandem with the mother’s improved skill in interpreting this communication (Skinner et al. 1998). Visual interest in food items during a meal followed by disinterest has been noted in a number of studies as an indicator of appetite and satiation. For example, gaze aversion, when infants look away from the caregiver as food is offered, is identified as a potent disengagement cue (Sumner and Spitz 1994), and visual attentiveness to the caregiver at the start of a meal is regarded as an indicator of infant feeding responsiveness (Hodges et al. 2013). Recent evidence from the Leeds laboratory has demonstrated that shifts in gaze may reflect changes in interest in food during a meal (McNally et al. 2019). In this study, 20 mother-infant pairs were filmed consuming a solid meal on two separate occasions. Infants were aged between 6 m and 18 m (mean age 11.7 months ±3.40). All infants had been breastfed at birth for at least a few days, average breastfeeding duration was 24 weeks, and solids had been introduced at around 22 weeks. Gazing at food was most frequent during the initiation of eating and then declined during the first course. At the same time, exploratory gaze involving intent gazing at feeding utensils, food remnants, or other objects while touching or manipulating them increased during the first course. Interestingly, when a second course was presented to the infants, gazing at food resumed in the early stage of intake and then declined over time, perhaps signalling sensory-specific satiety (McNally et al. 2019). Mothers’ perceptions of infant feeding cues in the first 2 years of life generally reveal that hunger cues are easier to perceive than satiation cues and that feeding cues are easier to interpret as children grow older (McNally et al. 2016). It is likely that with developmental maturity, infants become more adept at communicating hunger, appetite, and satiation. However, caregivers must also learn to recognize and respond to these cues over time. In summary, during milk feeding, the first form of communication about hunger status is through hand to mouth, agitation, orienting toward the breast/bottle, and culminating in the “hunger” cry. As infants develop, infants signal interest in solid foods through visual interest in family foods, fussing, agitation, and licking their lips. Appetite is signalled by mouth opening in response to food, eagerness to accept foods offered, the rate at which food is accepted, and gazing at food. Satiation is initially signalled through disinterest and sleep and later signalled through avoidance cues such as slower rate of acceptance of food offered, gaze aversion, turning the head away, pushing food or spoon away, and twisting the body away from food offered. As children progress to solid foods, the approach and avoidance behaviors develop further in scale and scope. With maturity, infants begin to use language to signal enjoyment of food and to indicate likes/dislikes. The urgency and survival value of communicating hunger is simple, strong, and dramatic, taking precedence over other needs. Cues to signal fullness appear later than hunger cues and responsiveness to these may depend on characteristics of the mother including breastfeeding duration, BMI, and education. Gazing at food appears to reflect interest in eating (appetite), and this wanes during the course of a meal. Therefore, there are a number of cues used by infants to signal their underlying need state which change as the infant is fed; and it is up to caregivers to notice these subtle changes in cue communication. The extent to which mothers and other carers identify, recognize, and respond to infant feeding cues will determine whether infants are fed responsively. The ways in which parents feed their children and their understanding of their infant’s appetite cues influence the early entrainment of appetite control (Disantis et al. 2011; Hurley et al. 2011). For example, DiSantis et al. (2011) proposed that “responsive” mothers are sensitive to hunger and satiation cues and respond appropriately, while discordant responses to infant cues such as pressuring to eat or overriding the cues of satiation might increase overfeeding and risk of obesity. Similarly, Worobey et al. (2009) found that mothers with lower sensitivity to feeding cues at 6 months had infants who gained more weight between 6 and 12 months than mothers with a higher level of sensitivity. Also, restrictive and indulgent feeding practices were associated with a high BMI in infants and young children (Hurley et al. 2011), and the use of assertive prompts to eat and intrusiveness during the meal predicted higher adiposity in toddlers (Lumeng et al. 2012). Taken together this evidence indicates that parents may override infant signals of hunger, appetite, and satiation and superimpose their own expectations about when eating begins, how much to feed, and when eating ends. Mothers who breastfeed might be more responsive to infant feeding cues than mothers who formula feed assuming that mothers who breastfeed situate control of the timing and volume of milk feeds with their baby. When mothers feed formula or breast milk via a bottle, they are more able to judge the volume consumed, and the temptation to encourage babies to finish the bottle is possible. It has been found that more intensive bottle feeding (breast milk or formula) results in a greater risk of overconsumption (Li et al. 2008, 2010) and, therefore, it is not merely the source of the milk supply but also the delivery method which matters for weight regulation. Feeding from a bottle (breast milk or formula) is also associated with a lower ability to self-regulate intake than feeding directly from the breast (Arenz et al. 2004). In order to understand better the potential differences in mealtime interactions based on prior milk feeding experience, we conducted a series of investigations in the UK and Israel on the same cohort of infants from the milk feeding stage to solid food introduction to 24 m (Shloim et al. 2014, 2015, 2017, 2018). Milk feeding was filmed in 27 mothers (13 breastfeeding; 14 formula feeding), and infant appetite cues were recorded when the infants were aged between 3 and 22 weeks. Engagement (interest in the feed) and disengagement (signalling disinterest) cues during the feed were recorded at the beginning, middle, and end of the meal. Examples of engagement cues included sucking sounds, mutual gaze, and opening the mouth in readiness to feed, whereas examples of disengagement cues included pushing away or back arching. Over time, engagement cues tended to decrease, and disengagement cues tended to increase, reflecting the transition from interest in milk to disinterest and satiation. Breastfed infants tended to display both types of cue more frequently than formula-fed babies, and they opened their mouth indicating readiness to eat at the beginning of the feed compared to formula-fed infants (Shloim et al. 2017). This suggests that breastfed babies were more active participants in the feed and signalled more to the mother their appetite and satiation status. Mothers from the same cohort were then filmed during mealtimes on four further occasions postpartum (2–6 m, 8–12 m, 14–18 m, and 20–24 m). Feeding behaviors were coded using the Simple Feeding Element Scale (Shloim et al. 2015). In the first measurement postpartum, mealtime interactions indicated that women who breastfed (rather than bottle fed or fed solids) presented fewer distractions during the meal, provided a more ideal feeding environment and fed more responsively (Shloim et al. 2017). In the subsequent measurements, infants were more likely to communicate potent engagement cues such as babbling, mutual gaze, and looking at mother with developmental maturity, whereas disengagement cues remained stable over time. 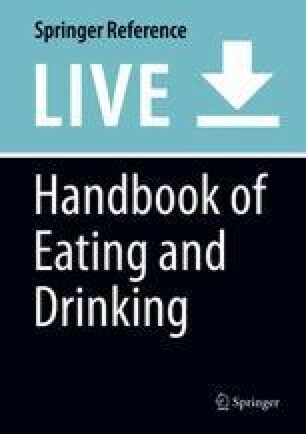 Interestingly, disengagement cues such as fussing and tray pounding were most likely to occur at the end of the meal signalling disinterest in eating (Shloim et al. 2018). Interventions to encourage more responsive feeding in bottle-fed babies have been conducted by Ventura and her colleagues (Ventura and Golen 2015; Ventura and Hernandez 2018). In these studies, mothers were given clear bottles or opaque, weighted bottles from which to feed their infants. The opaque, weighted bottles resulted in mothers feeding infants less formula, feeding them at a slower rate, and displaying more sensitivity to the infant’s satiation cues compared to using the standard, clear bottle (Ventura and Hernandez 2018). This simple manipulation appeared to direct mothers away from crude volume control toward reading their infants better. Crucially, there was a strong moderating effect of the clarity with which infants expressed satiation cues. Thus, infants who were rated as displaying more obvious satiation cues were fed less in the opaque condition than the clear condition, whereas lower clarity of cues resulted in equivalent amounts of milk fed to babies in each bottle condition. This illustrates the importance of infant proficiency in expressing cues as well as maternal sensitivity to these cues. In summary, developmental maturity ensures that infants express more diverse and assertive means of communicating hunger, appetite, and satiation; however, responsiveness to these cues may be influenced by features of the mother such as her BMI and the ways in which she feeds her baby (via breast or bottle). There is evidence that breastfeeding mothers are more responsive to their infants, and in part, this could be due to the communication proficiency shown by breastfed babies (Shloim et al. 2017). Finally, the bidirectional nature of the mealtime interaction means that more proficient communication of appetite and satiation by the infant may also result in more responsive feeding by mothers, and responsive feeding in turn encourages greater proficiency in expressing appetite and satiation cues. Infants make the transition from univore to omnivore and, in so doing, demonstrate a diverse range of ways to communicate to caregivers their needs. They become more adept at conveying appetite, interest in food, liking, wanting, and satiation through a range of behaviors. Babies are capable of self-regulation demonstrated during milk and early solid food feeding, but the ability to compensate for additional energy in the short-term declines with age. Therefore, caregiver responsivity to infant communication is central to facilitating self-regulation. A number of research tools have been developed and tested to identify the communication cues used by infants. Some coding systems can be applied to detect liking and wanting first foods offered around the time of complementary feeding (Hetherington et al. 2016; Nekitsing et al. 2016). Other tools such as the RCFCS permit a sensitive analysis of the ways caregivers recognize and respond to child feeding cues (Hodges et al. 2013). Mealtime interactions reveal the bidirectional and reciprocal nature of communication between infants and their caregivers, and targeted interventions designed to promote responsive feeding have shown that parents’ ability to respond to their infant is modifiable. In summary, human infants are highly dependent on their caregiver to provide sufficient energy for survival; they are capable of self-regulation but need the caregiver to respond promptly and appropriately. Recording mealtime interactions offers the researcher a means to identify the bidirectional nature of responsive feeding which is based on caregivers being able to recognize and respond to infant communication. Characterizing infant cues and encouraging caregivers to engage in responsive feeding may provide an opportunity to intervene to promote self-regulation, healthy eating, and growth. However, infants also vary in their proficiency to communicate energy needs and eating traits such as fussiness may contribute to difficult mealtime interactions. Understanding both the caregiver’s ability to recognize cues and the infant’s ability to convey their needs is crucial to effective communication of hunger, appetite, and satiation.